Finish First with Tapepro Boxer Kits. All your finishing tools conveniently come well protected in the durable, shock resistant waterproof tool case designed to extend the life of your tools. With 4 convenient options, the Boxer Kits are a combination of your favourite flat box series with either the traditional Blue2 or T2 Flat Boxes from the trusted Tapepro range. Complimenting the flat boxes is the compact Shorty Handle and Recess Plate that converts your 200mm flat box width to 140mm. 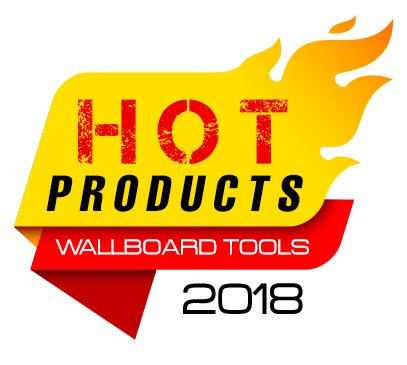 The Wallboard Plastic Taping Tool allows you to simultaneously apply joint tape and compound to flat joints bedding in tape in one easy step. The control knob allows you to get an accurate and consistent coating of mud under the tape with the stainless gears automatically gripping and dispensing tape onto the surface. The simple “mud bath” design makes the Tapepro Mud Box Original the fastest professional taping tool to learn and is fast and easy to clean.It can be used with 75 or 150m rolls of paper tape and chemically setting compounds. Featuring a spring-loaded combination creaser wheel and tape cutter, large tape wheel and mud flow adjuster. The flexible yet robust Trim-Tex Tear Away Archway Shadow Bead conforms to a minimum radius of 600mm and is perfect for creating a 10mm x 10mm reveal effect around columns or curved walls. The tear away strip acts as a guide for your taping knife and protects the reveal from compound, making cleaning up a breeze. The Tapepro ProReach® Extendable Handle hosts the Tapepro tried, tested and proven “all-position” brake and will extend from 980mm to 1600mm, which is handy for switching from walls to ceilings. It has four independent locking points and weighs in at just 1.4kg. It can be used with all flat boxes and is made from comfortable and durable anodised aluminium tube. The Wallpro Power Sander is a variable speed 650-1600RPM, 550w heavy-duty plasterboard sander featuring advanced soft start motor and unique full movement swivel head. It comes with a universal connection to be used in conjunction with any dust extractor to result in a virtually dust free sanding environment. The Outside Corner Roller is designed to be used on a variety of 90° outside corner beads including Trim-Tex and No-Coat. The rollers pivot in the centre allowing for corners that are not exactly 90° and corner beads that have either tapered or parallel legs. It features a stainless-steel body with acetal rollers and bushes. You can buy the Outside Corner Roller head on its own, with a 1200mm fixed handle or with the Pro-Reach Extendable Handle. Trim-Tex Flat Tear Away Bead is not your average stopping bead. Unlike regular L Beads, Trim-Tex Flat Tear Away Bead has no return leg, making it the perfect solution for areas where a return cannot be slipped behind the plasterboard. Flat Tear Away Bead is designed for finishing the edge around window frames and doors jams. The Tapepro Compound Applicator Tube is a robust and versatile taping tool with a quick release nozzle and piston rod for fast and easy cleaning.Designed to be used with of any of the specialised mud heads or nozzle the Compound Applicator Tube can complete a range of tasks including application of compound, finishing internal corners and the application of cornice cement.